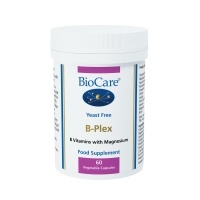 There are a large number of B vitamins - all involved in the process of the metabolism of living cells. Working with proteins, they serve as coenzymes in the various enzyme systems of the body. 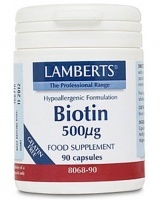 B vitamins must be replaced regularly because they are water-soluble and are not stored in the body to any extent. Also, because B vitamins work together synergistically, insufficient intake of one or more B vitamins can hamper the utilization of others, causing an imbalance to occur. 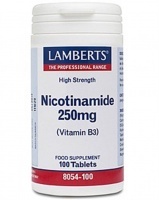 Read more about the various B vitamins beneath the product listings. 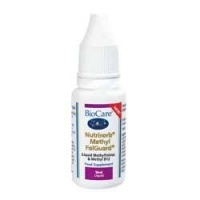 Nutrisorbå Methyl FolGuardå is a high potency liquid supplement of optimally bioavailable, metabolically active forms of vitamin B12 (as Methylcobalamin) and folate (as Methylfolate) to support healthy methylation. 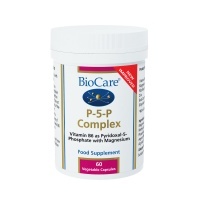 BioCare P-5-P complex health supplement combines B6, magnesium, zinc and vitamin B2 for proper utilisation of B6 in the body. 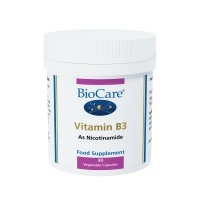 Vitamin B3 supports nervous & digestive systems. It is particularly needed by those individuals who have a low calorie or nutritionally limited diet. 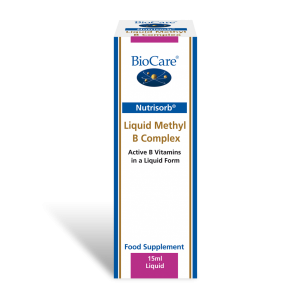 BioCare Vitamin B6 Health supplement - needed for correct metabolism of proteins & the production of neurotransmitters and certain hormones. 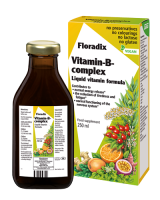 A highly absorbable liquid B vitamin health supplement for individuals with digestive & absorption difficulties. 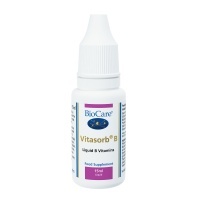 BioCare Vitasorb B12 is a liquid vitamin health supplement absorbed efficiently. 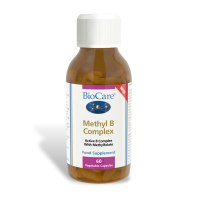 Vitamin B6 contributes to functions such as normal functioning of the immune & nervous systems, energy metabolism & reducing tiredness & fatigue. Higher Nature True Food B Complex - essential for helping maintain energy throughout the body, & for a healthy nervous system. Vitamin B6 is a great all-round ‘workhorse’ vitamin that helps to reduce tiredness designed especially for women. 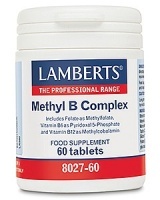 Lamberts Methyl B Complex is a superior and comprehensive B Complex supplement. Vitamin B1 (thiamin) is a coenzyme involved in the metabolic pathway which converts carbohydrates such as glucose into energy. It is essential to help maintain the proper functioning of nerves, muscles, the heart and the brain. 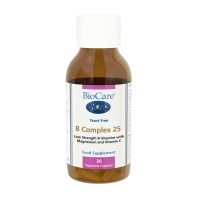 Vitamin B2 (riboflavin) is a coenzyme that activates the breakdown and utilization of carbohydrates, fats and proteins. It is essential to help produce cellular energy. 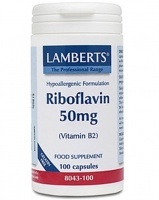 Riboflavin is closely related to the metabolism of protein and all functions requiring increases in protein such as growth. 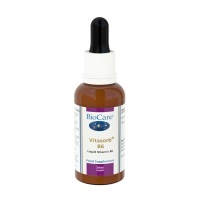 Riboflavin is also essential to help maintain healthy eyes. Vitamin B6 (pyridoxine) serves several essential roles in the body. It is a coenzyme in protein metabolism. It is needed to help in the conversion of tryptophan to niacin. It is also needed to help in the formation of red blood cells. 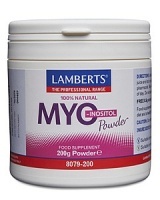 It facilitates the release of glycogen for energy from the liver and muscles. It also participates in the utilization of energy in brain and nervous tissue, thus being essential in helping to regulate the central nervous system. Vitamin B12 (cobalamin) is the only vitamin that contains cobalt, a trace mineral. 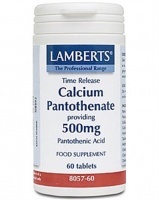 It is essential to help maintain the normal functioning of all body cells, especially those of the bone marrow, gastrointestinal tract, and nervous system. 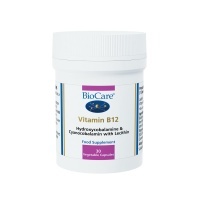 B12 is also necessary for forming red blood cells. The metabolism of vitamin B12 is closely correlated with folate (folic acid) metabolism.